(Office of Her Majesty, Press Department - Washington, D.C. ) The values of understanding, knowledge, hope and respect are the cornerstone of a future of 'peace and shared progress', a future, which we must all aspire to build and enjoy. This was the focus of Her Majesty Queen Rania Al-Abdullah's remarks, on Tuesday, at the Mosaic Foundation Ninth Annual Benefit Dinner, in Washington, D.C., which was hosted by the wives of Arab ambassadors to the US. The Mosaic Foundation is a charitable organization, founded by the spouses of 17 Arab ambassadors to the US, working to improve the livelihood of women and children and increase understanding of the Arab world in the United States, since its inception in 1998. Attended by US First Lady Laura Bush, the Honorary Chair of the event, the Benefit Dinner, was held in support of Sesame Workshop, the non-profit educational organization behind Sesame Street and other educational programs for children, which was founded thirty seven years ago. Queen Rania began her address by praising the work of the Mosaic Foundation, as well as that of Mrs. Bush "for her lifetime of service on behalf of children, literacy and education". She also stressed that the foundation has been instrumental not only "in lifting the lives of women and children around the world…" and "in showing how much Arab women can do, individually and collectively", but in supporting "a range of extraordinary organizations", most notably the Sesame Workshop, an institution that "is especially close" to her heart. Drawing on her own childhood experiences, Queen Rania commended Sesame Street for its "joyful approach to learning and life", which "made an unforgettable impression" on her, one that is still with her today as she watches Hikayat Simsim, the Jordanian equivalent of the show, with her four children. She credited the program's 35 years of success to the fact that it "has stayed in tune with times", reflecting the challenges of each country in which it is aired, while, at the same time, presenting the common values, which bind them together, irrespective of cultural differences and the language barrier. Speaking of the Arab region as an example, Queen Rania affirmed that "Sesame programming in the Arab world also reflects our region’s culture and concerns: In the words of one Jordanian, 'it teaches children the alphabet of life by delivering messages of hope…respect and understanding'…These messages work, because the values behind them make sense in any language: That all children deserve a chance to dream and discover… to understand the world and their place in it… and to reach their highest potential." Urging the world to follow Sesame Street's example in educating its citizens and spreading knowledge, because educated people are the driving force behind a'' global knowledge economy'', the Queen cited Jordan's efforts in the field. "In Jordan, we have taken the education challenge to heart. We are proud to have 99 percent of our children in primary school – with as many girls in our classrooms as boys. Now, we are focused on reaching kids in the Sesame generation – by expanding and improving our kindergarten classes… training teachers … translating Early Childhood Development curricula into Arabic… and forging new partnerships in Jordan and elsewhere to help us keep our reforms on the cutting edge," she stated, drawing a round of applause from the audience. Such partnerships and friendships, according to Queen Rania, help "strengthen our development at home – because knowledge is that rare kind of resource that grows when it is shared". And, in doing so, Queen Rania went to add, "we’ll enrich the “Three Rs” of reading, writing and arithmetic with a fourth and indispensable “R”: Respect for different cultures", which is the basis to a progressive future. In her remarks, Her Majesty also praised the collaboration between the Mosaic Foundation and the Sesame Workshop, known as the Sesame Mosaic program, calling it a "wonderful passport to understanding, for Arab and American children alike" and a "colorful project" that "can serve as a cultural embassy -- communicating the vibrant heritage and diversity of the Arab world". 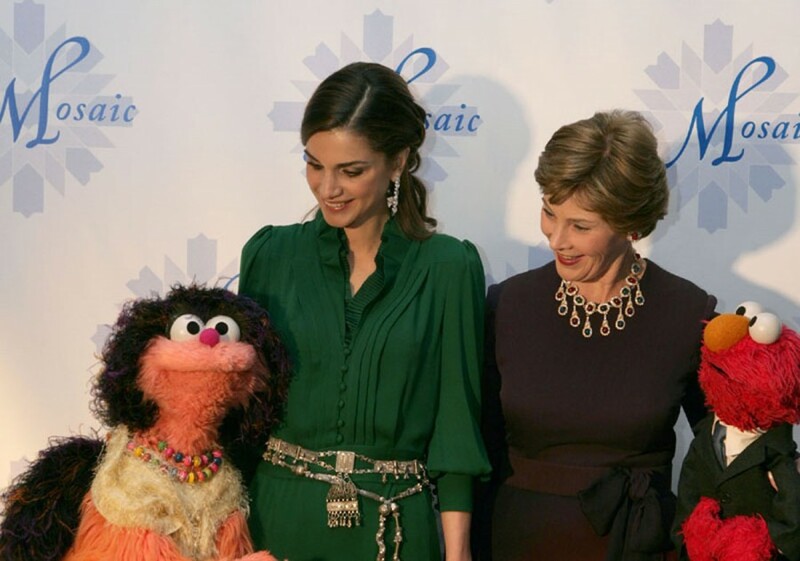 Queen Rania also spoke of the globalization of Sesame Street and its impact, extending, along with her friend Khokha from Egypt, an invitation to "Grover, Elmo, and their friends to visit us in the Middle East". "Indeed, with Sesame programs reaching more than 120 countries, its envoys – whether human, muppet or monster – can be Ambassadors of global goodwill… helping young children and their parents learn more about the world we share," said Queen Rania. Her Majesty concluded her remarks by inviting the audience to join her in renewing their "support for the values that pave the longest street in the world", urging them to "each add a stone", and telling them that, "while, separately, the little pieces may not be strong, together they will reinforce each other, in a great mosaic of hope and opportunity". In her remarks, Mrs. Bush spoke of her trip to Jordan in May of last year, where she visited a Discovery School "where children learned through technology and about technology in a co-educational environment" and met with "children who shared their thoughts about Jordan's future". Mrs. Bush said that the visit "was a reminder that our children have no shortage of ambitious dreams for themselves and for their societies". Queen Rania's participation at the dinner is part of a four-day round of activities she conducted in the United States, with the aim of promoting cross-cultural understanding and acceptance between and amongst Arab and American youth and children.